After a contentious holdout throughout the preseason, the Oakland Raiders traded Mack to the Chicago Bears in exchange for first-round picks in 2019 and 2020, a third-round pick in 2020 and a sixth-round pick in 2020. Then the Bears awarded Mack with a six-year, $141 million extension, with $90 million guaranteed, and made him the highest-paid defensive player in league history. Donald and Mack have proved to be worth every bit of their colossal deals, elevating the defenses for two of the NFC's best teams and Super Bowl contenders. As they share a stage in a big Week 14 matchup on Sunday night, here's a look at just how special each player has been this season. 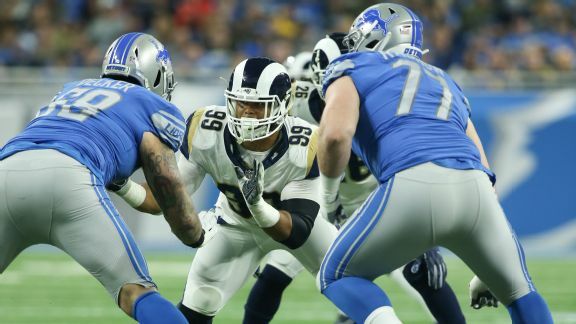 Aaron Donald had his sixth two-sack game of the season in Week 13 against the Lions to extend his NFL lead to 16.5. And he's doing it against double-teams way more frequently than the other pass-rushers who trail him. Donald leads the NFL with 16.5 sacks, and his late-game dominance has proved to be the difference in several close games. Donald sacked Kirk Cousins to secure a win over the Vikings. He pressured Russell Wilson into a haphazard pass to end a Seattle Seahawks last-chance drive. He strip-sacked Patrick Mahomes twice in an epic Monday Night Football showdown. And on Sunday, Donald shed two blockers, then strip-sacked Matthew Stafford to put the Rams in control over the Lions on the way to securing a division title. Khalil Mack is part of a Bears defense that ranks first in efficiency this season. That's a vast improvement from where they were over a four-season span from 2013-16 when they ranked 31st, and then 13th in 2017. But that's not the only category in which they've seen improvement. Vic Fangio inherited one of the NFL's worst defenses when he took over as the Bears' defensive coordinator in 2015 under then-head coach John Fox. 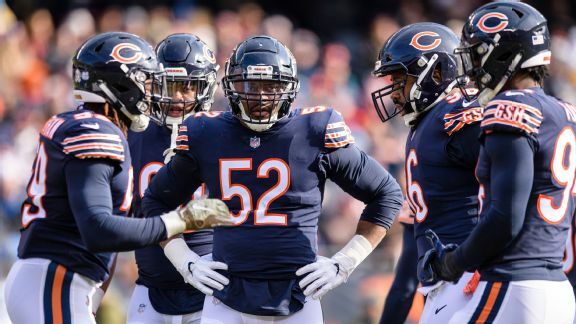 With the team adding talent and the veteran Fangio calling the shots, the defense improved under his watch, but it has taken a giant leap with the addition of Mack. That's what a dominant pass-rusher can do for a defense. And it's not just Mack's impact on the field that has been a difference-maker. "He's the richest man in the NFL, and you'd think maybe he'd coast and still play good," Bears defensive end Aaron Lynch told ESPN earlier this season. "But he's still playing like he's trying to get another $140 million contract. So that's what's cool for me, personally. Seeing how he still takes it so seriously." Mack doesn't get the double-team attention as often as Donald because Mack is an edge rusher, where he has lined up 99 percent of the time. While Mack leads the Bears in QB pressures, he has more help than Donald. The Bears have seven players with 10-plus QB pressures, tied for second in the NFL behind the New York Jets (eight). The Rams are tied for the sixth fewest with five players. And while Donald has more QB pressures than Mack, the Bears feature a bit more balance than the Rams. On Mack: "Khalil is great, one of the best, he understands what the job is, we get sacks, we have to make game-changing plays. No matter how many people chip you, double-teams, whatever, you have to get sacks no matter what. Khalil is strong, he’s got that power. [The offensive linemen] are bigger than you, big reach, you have to create that power sometimes to get an opening and he does that." -- Von Miller on Mack, who has attended the Broncos star's pass-rush summit in the offseason. On Donald: "You knew right from the start, beyond the physical things everyone sees, he was always going to work beyond anything most people do. He’d be on the phone as a rookie even, telling me, ‘just got done working out’ and he was planning on going back for more. You put that in an interior rusher with that kind of explosiveness, hands and power and you ain’t going to block him. He’s going to wreck what you’re doing. You don’t get a chance to be around many guys like that, I’ve been fortunate to have been, but he will always be on that list." -- Longtime NFL coach Dave McGinnis, who was a Rams assistant when they drafted Donald.